Strong, lightweight design for increased production with less effort. The hand truck professional use. Use the hand truck professionals use to move boxes, appliances, furniture, vending items and more. Vertical Loop handle provides easy maneuverability. The total hand truck height with this handle is 53"
Cast Aluminum base plate is 14" x 7.5 " deep, with recessed heel. I haven't used my hand truck too much yet. It seems to be a well built piece. We are getting ready to move, so it will get a workout in the near future. The product is exactly the way they describe it. 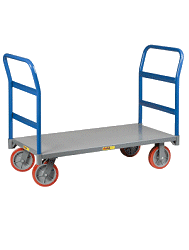 I love this hand truck because it is light weight and is a great value. I shopped around and there is no comparison when it came to the price. I also have to mention their awesome customer service !!! I tell everyone who is looking that HAND TRUCKS R US IS THE WAY TO GO. Thank you for a great product. Aluminum hand truck is lighter and somewhat more maneuverable than other trucks I've used. The extended nose worked great in carrying small furniture and large boxes. The long nose made holding onto cargo as they were carried up stairs easier.